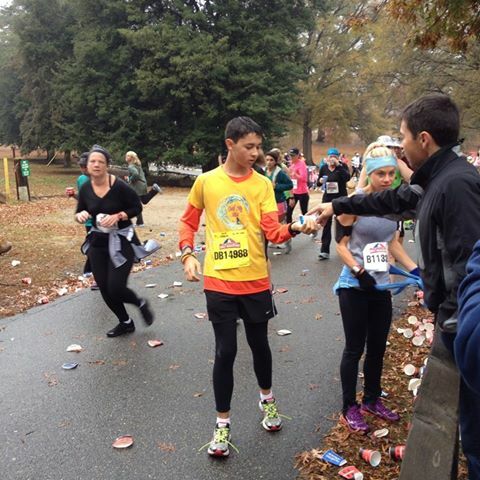 My son, the half marathoner. In a normal father and son relationship, the dad shows the son how to do something, then the son does it, for the first time, under his father’s supervision. The father corrects the child and encourages the child, in reverse order. Pick the culture, pick the language, pick the time in history….it doesn’t matter. The pattern is the same and hasn’t changed over time. Indeed, this is how culture is created and maintained. It was a learning experience to watch my son run his first half marathon. I was all but unavailable for him during the hardest part of his training, and I couldn’t run with him during Saturday’s race. My paid registration went unused, and my race number has long since been thrown in the garbage. He had to do this with others. We dropped him off at the start, with Whitney, an adopted daughter of the family, wishing him luck and reminding him that he was well prepared for this event. Even though it was raining, we knew he would be OK. We drove off to the halfway point on the race to await their arrival an hour or so later. Once we saw them and encouraged them, we packed up and moved to the finish line. We stood behind fencing put in place just for the race, and we joined the herds as we looked for his long sleeve orange shirt to come down the hill towards the finish line. As he sprinted to the finish line, a grand moment of enlightenment hit me. He didn’t need me or Mom for this event. He trained on his own and he raced on his own. He logged his preparation and monitored his own caloric intake with no input from Mom and Dad. This was his race. But none of that was enlightening. He did it as a response to my efforts, but he needed another reason bigger and better than mine. He did his race to raise awareness to someone less fortunate than he…someone that he could help. That was his motivation. 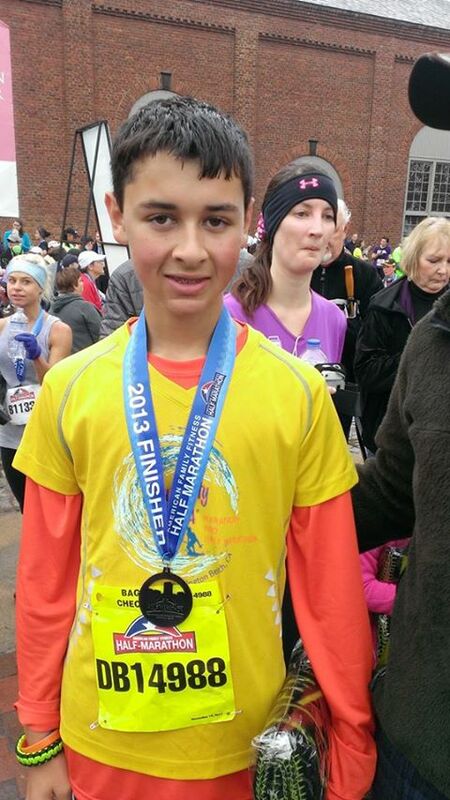 Running a half marathon at 12 years old is NOT normal, even for a conditioned athlete. Long distance running, especially when you are reaching for personal bests in either distance or time, hurts your body. This event was no different. Alex started feeling pain within a few minutes of finishing, and he spend the next 36 hours on OTC pain killers. Watching him walk down stairs reminded us all of watching a person on crutches come down the stairs…slow awkward and without rhythm. He ate all kinds of everything, including some spinach lasagna. He slept more than 12 hours that day. A normal “person” would experience something like that and quickly conclude never again to undertake such an ordeal. Yet, I get this sense that he is far from done with his giving. The newspapers did a great job at bringing attention to his efforts, and I dare not fathom how much money he raised. The teacher he was running for sent us messages of thanks and encouragement throughout, and we read them out loud, as they came in. He inspired others. He inspired his mom and me. He is precious.